Nessebar is one of the oldest towns in Europe, well known with its exotic monuments the Antiquity, its fascinating architecture of the Middle Ages and the National Revival period. The town is situated on a small rocky peninsula in the North part of the Bourgas bay. The old quarter of the town, situated on Nessebar peninsula and linked to the mainland by a narrow neck of land; declared an architectural and archaeological reserve. North and south of the peninsula there stretch beach strips covered with the finest sand along the Black Sea coast. To the north these are linked with the beaches of Sunny Beach. Nessebar is one of the oldest towns in Bulgaria. Ancient polis Mesambria appears in 6 c. BC in place of a Thracian settlement Melsabria (2nd - 1st millennium BC). Invaded by the Romans (1 c. BC), conquered by khan Kroum in 812 and annexed to the Bulgarian state. Efflorescence as a sea port and cultural centre reached under king Ivan Alexander (1331 - 1371). Circa 1452 Nessebar falls under Ottoman yoke and the fortress walls are demolished. During the Bulgarian National Revival the town is revived anew. Develops as a fishing and vine-growing centre. Since antiquity to the present day there have been preserved sections of the fortress wall, towers, a gate, sanctuaries, inscriptions, reliefs. Remarkable sites of Nessebar are its medieval churches. In the past these were more than 40, but only a few are still standing. Early Christian are basilicas, most famous among these - the Old Bishopric. The construction and plastic decorative peculiarities of Nessebar churches dating back to 10 - 14 c., sets them apart in a separate group, characteristic with the picturesque design of facades. Mural ornamentation of each church constitutes unique harmony of stone, red brick, multicolored ceramic rosettes and circular plates. Cross-dome churches are represented by "St. Ivan Krustitel" church, "St. Arhangeli Mihail I Gavrail", "Pantokrator" and "St. Ivan Neosveteni" . Single-naved are "St. Todor" and "St. Paraskeva" churches, "St. Stephen" church is a basilica (New Bishopric). In 1958 archaeological excavations uncover a medieval golden treasure of adornments which is kept in the historical museum of Bourgas. The Bulgarian National Revival architectural ensemble encompasses some 60 houses, picturesquely overhanging narrow cobbled streets. Architectural design is typical of the Black Sea coast house - stone basement, paneled upper floor, numerous bay windows, supported by corbels. 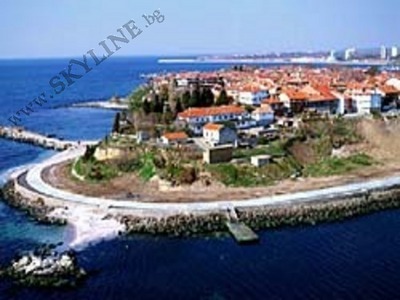 In 1956 Nessebar was proclaimed an archaeological and architectural reserve and in 1983 the cultural monuments of the town were included in the list of UNESCO. Captain's house is built in the Bulgarian National Revival style, situated on the high stone coast above the port. The elevated stone basement is occupied by store rooms on two levels. On the floor above there is a T-shaped parlour and 4 spacious rooms in the corners with open on the facade. A relief badge of the guild is inbuilt on the southern wall. Mouskoyani's house - follows almost the same inner design as Captain's house. The parlour has an abundantly decorated ceiling, adorned with a round rosette. An ethnographic exposition has been arranged in the house.